According to a new report, the global Massive MIMO technology market is expected to reach USD 20.852.2 Billion by 2026. It is projected to grow at a compounded annual growth rate (CAGR) of more than 39% from 2018 to 2026. This market was valued at US$ 1,051.8 Mn in 2017. Advancements in 4.5G technology, improved SNR (signal to noise ratio) and link reliability and expected launch of 5G in 2019 are primary factors that are expected to boost the market during the forecast period. With significant advancements in wireless communication technologies, the world is becoming more connected. There are already strategies and projects in place for smart cities, self-driving cars are on the horizon, social media has grown at a vast scale, and Internet of Things (IoT) devices and solutions are taking off. Significant adoption of 4G LTE in all these arenas is generating tremendous amounts of data and the expected launch of 5G is poised to connect billions of devices in the coming years. 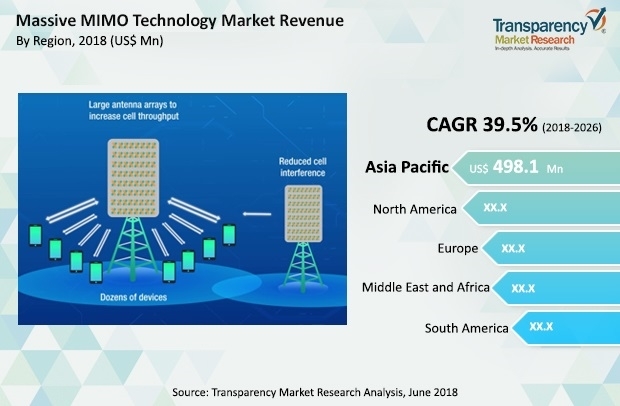 The report published by Transparency Market Research (TMR) is titled "Massive MIMO Technology Market - Global Industry Analysis, Size, Share, Growth, Trends, and Forecast, 2018-2026." The basic idea behind Massive MIMO framework is the use of multiple antenna arrays at the base station to reduce the error rate and increase efficiency which results in the overall system becoming more complex than traditional systems. The complex structure makes it difficult to diagnose the problems occurring in Massive MIMO systems. Furthermore, as a result of use of huge number of antenna systems and complexity, Massive MIMO systems are far more expensive than traditional antenna systems. In terms of technology, the Massive MIMO technology market is segmented into LTE advanced, LTE advanced pro, and 5G. In 2017, the LTE advanced segment accumulated the highest share of the market and is projected to witness significant CAGR over the forecast period. LTE advanced solutions support data rates up to 1 Gbps and in turn improves the customer experience. Also, 5G cellular networks are expected to be commercially deployed by the end of 2019. However, some of the global leading network providers are upgrading their existing infrastructure with 5G-ready network solutions which can support both existing and 5G networks. The market in Asia Pacific is expected to expand at a considerable CAGR during the forecast period. This growth is mainly due to the presence of well-established market players such as ZTE Corporation and Huawei Technologies Co., Ltd. Also, the growth is fueled by significant economies such as China, Japan, and India. Furthermore, players from the region are establishing partnerships with various local players for market expansion as well as technology advancement. For instance, ZTE Corporation has been teaming up with various regional players and network operators for 5G trials. In October 2017, ZTE, in collaboration with Japanese carrier SoftBank Group Corp, achieved 1Gbps topmost data rate speed in pre-5G, a Massive MIMO (multiple in multiple out) trial. Additionally, in February 2017, ZTE, in partnership with Smartfren, successfully completed Pre5G Massive MIMO tests at Teras Kota shopping mall in Jakarta. Various companies are establishing partnerships, and are carrying out strategic expansions to enhance their Massive MIMO technology offerings worldwide. For instance, in December 2017, Huawei released high bandwidth (200MHz), high power (200W) Massive MIMO active antenna units (AAUs) known as 'Dual-200.' The solution integrates Huawei's RF chip power amplifier technology and innovative antenna array technology to deliver improved wireless network capabilities.